While the Charleston RiverDogs have jumped full-fledged into their new “Be Your Own Fan” marketing campaign for the 2010 season, the slogan does not merely refer to individual perspective concerning gameday enjoyment and promotions, but also to what it means to support humanitarian volunteer efforts outside of the ballpark. On Tuesday, the RiverDogs front office staff paid a visit to the Windwood Farm Home for Children in Awendaw to paint one of the organization’s houses and to learn more of its overall mission. Windwood Farm Home for Children is a private, not-for-profit treatment facility for young boys who have been removed from their homes due to abuse, neglect or violent and unstable home situations. Local businessman Joseph L. Tamsberg, Jr. founded Windwood Farm in 1985 when he donated property along the Wando River that borders Francis Marion National Forest in Awendaw. For almost 25 years, Windwood Farm has helped hundreds of young boys deal effectively with their violent and abusive pasts and move toward a more hopeful future. Windwood Farm provides residential group care services to 28 “at-risk” boys between the ages of 5 and 16. These children are considered to be “at-risk” because they are most likely (because of childhood abuse and trauma) to engage in anti-social, self-destructive, and/or criminal behavior. Their life circumstances have left them in need of intense, round-the-clock supervision and care by professionals trained in interventions that assist in the healing process. As part of their monthly volunteer ventures, the RiverDogs have also donated their time at Crisis Ministries, Habitat for Humanity, Keep Charleston Beautiful and the South Carolina Oyster Restoration and Enhancement (SCORE) program. The Joseph M. Bryan Foundation announced Thursday that Donald Moore, President and General Manager of the Greensboro Grasshoppers, earned its 2010 Unsung Community Hero Award. The Bryan Foundation awards this honor annually in recognition of individuals who have made significant contributions to the community, but whose good works are not widely recognized. Carole Bruce, a member of the board of directors of the Bryan Foundation, presented the award to Moore during the Bryan Foundation’s annual luncheon and meeting, with his family and staff present. As part of the award, the Bryan Foundation will give $25,000 to the Atlantic Coast Conference in Moore’s honor to be used on behalf of the ACC Baseball Tournament that will be hosted in May at NewBridge Bank Park. Under his leadership, the Hoppers have welcomed over 2.1 million fans in their first five seasons, becoming the only Class A team in the history of Minor League Baseball to draw over 400,000 fans and grow its attendance four straight years in a new ballpark. The Grasshoppers were the proud recipients of the South Atlantic League’s Club Merit Award four of the past five years, with Donald garnering additional accolades as the league’s General Manager of the Year Award in 2005, 2006, 2007 and 2008. Baseball America honored Moore and the Grasshoppers with the prestigious Bob Freitas Award for the Single-A level in 2008. Moore has created several college scholarship funds, including the Bill Lee Memorial Scholarship and the Charlie Harville Memorial Scholarship. He currently sits on the board of The Bryan Family YMCA, The Guilford County Sports Hall of Fame, Downtown Greensboro, Inc., and is President-Elect of the Greensboro Sports Council. 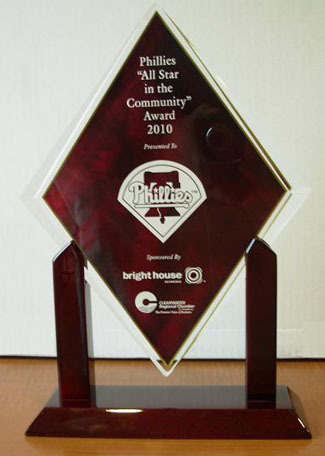 The Clearwater Regional Chamber of Commerce awarded the Phillies organization with the first-ever Phillies “All-Star In The Community” Award this past Thursday night at the Clearwater Regional Chamber of Commerce annual dinner. The award has been designated to honor those that show overall commitment to the local community as well as support for its businesses. Accepting the achievement was Philadelphia Phillies President and CEO David Montgomery and Director of Florida Operations John Timberlake. The Phillies are set to begin their 64th year of spring training in Clearwater and have built strong ties in the local community. This past year, the Phillies along with the Threshers have contributed to over 75 charities and events. It was because of this that the Chamber of Commerce decided to not only award the organization, but to name the award in their honor. The award will not be given out yearly, but on merit to organizations or businesses that meet the criteria as set by the Phillies. The Threshers will continue to donate and work with charities this season through various promotions and events such as Bark at the Ballpark, where fans can bring their dogs to Bright House Field to raise money for the Humane Society of Pinellas County and Pitch for Pink night on August 6th which will benefit Morton Plant Mease breast cancer programs. The Delmarva Shorebirds have teamed up with Sylvan Learning Center and Farmers Bank of Willards to kick off the 2010 “Hit the Books” Reading Program. The “Hit the Books” Reading program is designed to promote reading outside the classroom. Participating students are asked to read four books of their choice and track their progress on the official “Hit the Books” bookmark given to all students. Each book completed gets them to the next base and when they hit their homerun they are rewarded with two complimentary tickets to a Shorebirds game and the chance to set foot on the field and represent their school in a pre-game parade with Sherman. “We’re proud to participate in this year’s reading program. Sylvan and “Hit the Books” are a good match because we have a common goal- to reach as many students as possible across the Eastern Shore and get them excited about reading. We look forward to recognizing their hard work and achievement at the Perdue Stadium this spring, and we hope the Delmarva community will join us in honoring these great readers as well,” said Becky Grinath, Director, Sylvan Learning Center. This season, the “Hit the Books” program will reach more than 45,000 students from 121 schools across the Eastern Shore. To accommodate the growing number of students who complete the program each year, the Shorebirds have added two additional dates, raising the total from six in 2009 to eight in 2010. The Stockton Ports are pleased to announce that, through the generosity of the Stockton community, they were able to raise more than $7,000 at the Ports 3rd Annual Hot Stove Banquet to benefit their community fund, the Anchor Fund, which was held on February 4. The Anchor Fund, which aids several community projects, with a focus on youth centers and youth sports, benefits from the funds generated through the Banquet’s ticket sales, raffle and silent auction sales, and donations. The Hot Stove Banquet, the first Ports event in 2010 to benefit the Stockton Ports Anchor Fund, provided fans with an opportunity to participate in a night of baseball, complete with a keynote address and Q &A session with Oakland Athletics TV Play-by-Play Announcer Glen Kuiper, memorabilia raffles and a silent auction. Fans also enjoyed a Q&A session with Lieppman and an address by Scarsone. The 130 attendees enjoyed cocktails and a slideshow highlighting the 2009 season before dinner began, and they were able to purchase raffle mini-bats for items from major and minor league baseball teams from around the nation. Such items included team autographed baseballs, bobbleheads, photos, and merchandise. A silent auction was also open to fans, with autographed memorabilia from athletes such as Dallas Braden, Kareem Abdul-Jabbar and Magic Johnson, Roger Clemens, Maury Wills, Duke Snider and much more. The Ports also auctioned off gift certificates to area restaurants, hotels, golf clubs and more. Before the speakers took the podium, the Stockton Ports honored area high school stars Louie Lechich of St. Mary’s High School in Stockton and Tori Shepard of Lodi High School as the Greater Stockton Area High School Baseball and Softball Players of the Year, respectively. Filippone was the first to address the crowd, highlighting the importance of community involvement and the Ports continuing support to the Stockton community. Filippone also stressed the value of Stockton’s affiliation with the Oakland A’s and the hope for another strong season with A’s prospects. Lieppman was the next to speak, and discussed the strength of the A’s farm system, and the important role the Ports play in developing players for the major league level. He also opened up the floor to questions, answering fans’ queries on Barry Bonds, Dallas Braden and recently acquired prospect Michael Taylor. Scarsone was formally introduced to fans next. He encouraged fans to speak to him and get to know him during the season, and joked that he would win 2 of the first 12 games, improving on the Ports’ 1-12 start in 2009. 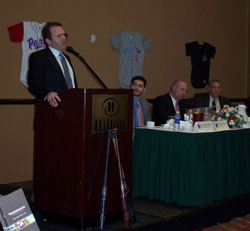 The event finished with Kuiper delivering his keynote address. Kuiper related some anecdotes about his past experiences with Scarsone, assuring fans that they were getting a top notch manager for the 2010 season. He also talked of his past visit to Stockton, in which he saw Dennis Eckersley make his professional debut against the Ports in 1972. Kuiper added he hoped to get to Stockton again in the 2010 season. Kuiper then opened the floor for questions. He answered questions ranging from the A’s radio and television broadcasts in 2010, to his relationship with the San Francisco Giants and his brother. With Spring Training just around the corner, fans are close to seeing the Stockton Ports and Oakland A’s begin their search for greatness in 2010. “Following a year in which the Ports donated approximately $35,500 and nearly $107,500 of in-kind donations, including 13,250 tickets to local non-profit organizations, charities and schools through the Anchor Fund, we definitely look forward to another successful year on and off the field,” Filippone said. 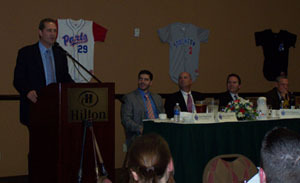 Ports President/GM Pat Filippone addresses the audience at the Ports 3rd Annual Hot Stove Banquet. Keynote Speaker and Oakland A's TV play-by-play announcer Glen Kuiper talks of his past experiences with new Ports manager Steve Scarsone. The Bowie Baysox took an icy plunge today at Prince George’s Stadium after missing the 2010 Polar Bear Plunge on Saturday, Jan. 30, due to inclement weather. The team raised more than $350 to benefit the Special Olympics Maryland for the event. 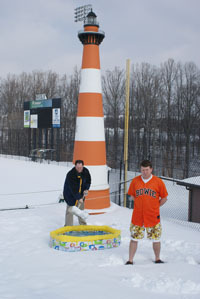 Baysox Communications Manager Tom Sedlacek and his assistant Rob Bartlett prepared for the Polar Bear Plunge at Prince George's Stadium. Bartlett was responsible for making sure the water temperature in the pool matched that of the Chesapeake Bay. 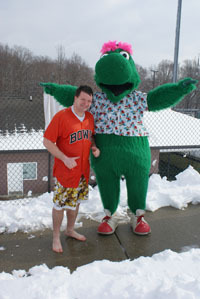 The Baysox lovable mascot Louie congratulated Sedlacek for taking the plunge.